My family and Ed’s family love this sweet potato pie. It’s quite a bit of work so I only make it once every 3 years (despite their constant requests for more). 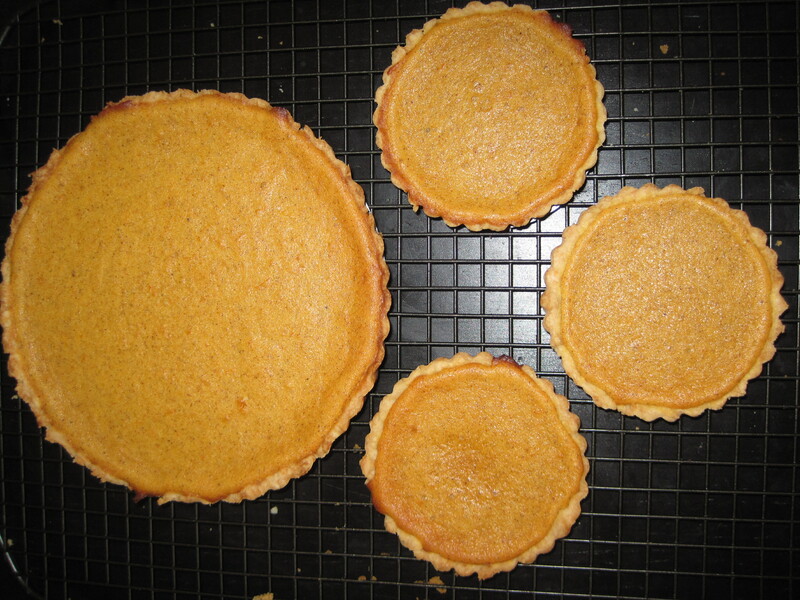 But every time I make it, I make a few 9″ pies and several individual sized pies (I love making miniature foods). Note that Tyler Florence suggests a crunchy cranberry topping to go with this, but I’ve never felt that my pies needed it. Prick the sweet potatoes with a fork and bake them until they are soft, about 1 hour. (*Note: It has always taken me much longer than 1 hour because it is important that the sweet potatoes are Very soft. *) Remove from the oven and set aside until they are cool enough to handle. While the potatoes are cooking make the pastry: combine the flour, sugar, and salt in the bowl of a food processor. Add the butter and pulse until the mixture resembles coarse crumbs. With the machine on, pour in the ice water and work it in until the dough holds together without being too wet or sticky. Squeeze a small amount together, if it is crumbly, add more ice water, 1 teaspoon at a time, with the machine running. Form the dough into a ball, wrap it in plastic wrap, and refrigerate it for at least 30 minutes. Sprinkle the counter and a rolling pin lightly with flour. Roll the dough out into a 10-inch circle. Carefully roll the dough up onto the pin and lay it inside a 9-inch pie pan. Press the dough firmly into the bottom and sides so it fits tightly. Trim the excess dough around the rim and pinch the edges to form a border. Place a piece of parchment paper over the crust and fill with uncooked beans or pie weights. Bake the pie crust until it sets, about 20 minutes. Remove the parchment and beans. Brush the bottom with the beaten egg white and set aside. While the crust is cooking make the filling: When cool enough to handle, peel the sweet potatoes and puree the pulp in a food processor with 1/2 stick butter and a pinch of salt. Measure 1 1/2 cups puree into a bowl. In another bowl beat the eggs and sugar until the sugar has melted. Add the eggs to the sweet potato puree and whisk well. Add the cream, orange zest, cinnamon, and nutmeg and stir well to combine. Pour the mixture into the pie shell. Place the pie pan on a sturdy cookie sheet to catch any spills. Lower the oven temperature to 325 degrees F and bake until the pie is set but still jiggles slightly, about 40 minutes. Remove from the oven and allow it to cool. I have to say, I’m relieved to see that miniature marshmallows don’t feature here. I don’t know why, but all those US Thanksgiving recipes for sweet potato casseroles all seem to use miniature marshmallows as a topper, and it freaks me right out. The crust ended up being higher on one side than the other so the pie is slightly uneven. I think it may have to do with the way I had baked the crust when it was setting. Do you have any tricks for this or know what I may have done wrong? P.S. Krystal…we are patiently awaiting your verdict. Hi Matthew! I can’t believe how much you’re baking these days! You’re going to be Huge competition for me in this year’s baking contest 🙂 Have you given any thoughts to what you’re going to enter? About getting an even crust: When you’re rolling out the dough, you want to make sure that the thickness of dough is very even. This takes practice or you can buy some rolling pin rings. One goes on either end of your rolling pin and if they work properly, they ensure a consistent thickness of dough. But even if the thickness of your dough is consistent, sometimes it gets stretched out in certain spots when you transfer it to your tart pan, so it takes practice to be gentle with the dough and to be careful not to stretch it out. Finally, when you have placed the dough over the tart pan, just be sure to eyeball the thickness of the dough and make sure that it looks the same all the way around the edges. I also flatten the top of the crust edges with my hands so that I don’t get uneven thin ridges. This also helps to determine if the crust is the same thickness all the way around. You can use excess dough to patch up any thin areas. I hope this helps! Well, I told Krystal that I understand how much of a conflict it would be if we both entered the baking competition because she would have a very hard time voting for just one of us. She didn’t think I was funny at all when I said this. Obviously, your creation would win over mine, but coming in 2nd to you would be very honourable 🙂 I don’t know what I will be baking yet, but it will be from your blog so I will run it by K to make sure we don’t duplicate. I think I am going to look into the rolling pin rings. I also have to find where silpat mats are sold for the cookies. I’ll let you know how the crust turns out the next time I bake a pie. BTW, I really appreciate all the compliments you have sent my way. That is extremely nice of you and helps me with my confidence in the kitchen. Matthew, the sweet potato pie you baked was delicious!!! I didn’t notice any uneveness that I thought worthy of mention, but then again I’m no baker. I’ve eaten pies made from this recipe after having been frozen, and they were delicious as well. Great recipe, Alison!